"Let's drive out to the Shark Fin & see what else is on the way"...said my husband. I came across this stunning place when scrolling through my Pinterest board and to our luck it was only an hour or two drive from where we live. We both were like, "how have we not heard of it before"? i couldn't wait to get to the shark fin cove! how is it so cool? how can it be formed like that? I asked myself so many questions and couldn't wait to see it for myself. it's a little bit of a drive and we tried to see things along the way. 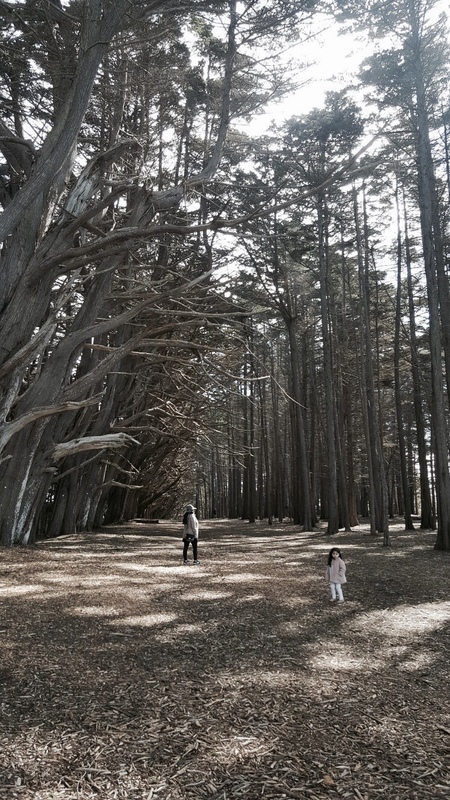 so We first stopped at the cypress tree tunnel at fitzgerald, it was like walking through a story book, it was also fun seeing my husband and daughter play peek-a-boo in the woods. (caught a fun boomerang of it on my insta-check it out!) We then stopped at the half moon bay at the ritz carlton for a fancy lunch, they had the prettiest menus and delicious fish SANDWICHES, we then walked around the ritz & enjoyed a hot CHOCOLATE by the fire with a BEAUTIFUL ocean view. as relaxing as it was, we needed to get to our shark fin cove! It was surreal. i had seen pictures but it never is the same until you see it in person. i had to change outfits here to get some cool photo shots at this amazing place!